In February of 1969, Srila Prabhupada gave a series of lectures in Los Angeles on the sixth chapter of the Bhagavad-gita, which deals with the yoga system. 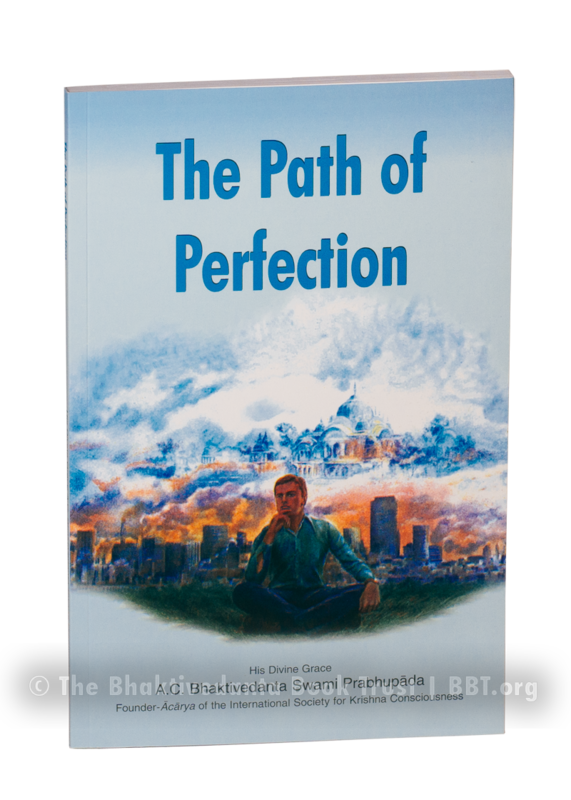 Path of Perfection is a collection of these historic talks. "No one really wants to sit down and meditate. Why should we? We're meant for positive activity, for recreation, for pleasure." He explains that a perfect life—in which the goal of yoga is reached—is dynamic and full of activity. Our nature is spiritual, and spirit is the essence of everything that lives. Real yoga means to connect our activities with the Supreme Spirit—in straightforward, practical ways. If perfection is possible, why settle for anything less? "Perhaps you have seen pictures of Krishna, and if so, you have noticed that Krishna is always jolly. If you join His society, you will also become jolly. Have you ever seen pictures of Krishna working with a machine? Have you ever seen pictures of Krishna smoking? No, He is by nature full of pleasure, and if you unfold yourself in that way, you will also find pleasure." In these absorbing talks, Srila Prabhupada deeply explores the philosophy of yoga as explained in the Sixth and Eighth Chapters of the Gita, showing clearly how these timeless teachings apply today. Learn about the nature of consciousness, techniques of meditation, karma, death, reincarnation, and even spiritual ecstasy.